When the Spherical Plain Bearing GE.LO Series is installed, due to the elastic deformation of the steel ball and the transfer of the contact points, even if the mounting surface is somewhat deviated, it can be absorbed by the inside of the line slider, resulting in the effect of automatic self-aligning ability. High precision and stable smooth motion. Due to the strict control of manufacturing precision, the size of the linear guide can be maintained within a certain level, and the slider has a retainer design to prevent the steel ball from falling off, so some Spherical Plain Bearing GE.LO Series precision interchangeability. 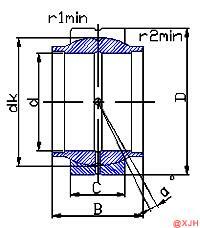 4) Features of structure: With oil groove and oil hole, with an axial split in outer race. Spherical Plain Bearing GE.LO Series is more accurate than normal mechanical parts, so care should be taken when using it. 1) Keep the bearings and their surroundings clean. 2) Careful and careful when using it. If you use it, carelessly give the bearing a strong impact, which will cause the bearing to be injured, indented, broken and injured. 3) Use the right tool. 4) Pay attention to the rust prevention of the bearing to avoid use in wet places, and wear gloves in order not to get sweat.